My name is Emma Lester and my Great Uncle Fligth Sergeant William (Bill) Reginald Caldwell was a member of 100 squadron, Bomber Command in WWII. Bill was a Lancaster pilot who was shot down over France (a village called St Oulph) on the night of 12/13th July 1943 on a mission to Turin Italy, he left Grimsby airbase at 22.18 on the 12th and was shot down about midnight. He was based in Grimsby England and was a member of 100 squadron, on the fateful night he was flying a Lancaster 1, serial number ED561 with squadron marking HW-F. None of the crew survived, they are all burried at St Oulph graveyard which I have visited. I have an eyewitness report of the tragic events of that night as well as a photo of the grave. 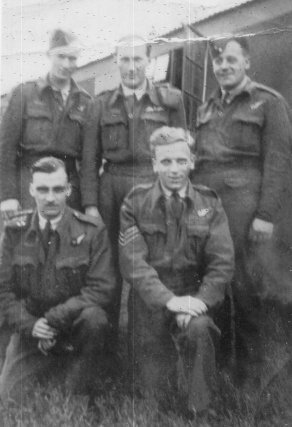 I know it is a long shot but have received any information about this crew? RAMILLY -SUR - SEINE. Violent reaction from anti-aircraft batteries. One four engined bomber hit by burst of A.A. burst into flames near St Oulph with its complete load of bombs and exploded. Many airmen killed. One of them still at his post, though burnt to a cinder. Human remains litter the ground, proving that other airmen are dead. In the remnants of a pair of trousers was found the enclosed article. The finder was Miss Raymonde Robert who lives CLESLES (MARNE) and who hopes to return it to the parents of the unfortunate soldier. I also attach a picture of the grave which I have visited in St Oulph and a picture of some of the crew who I would love to know the identity of. My Great Uncle is centre back.